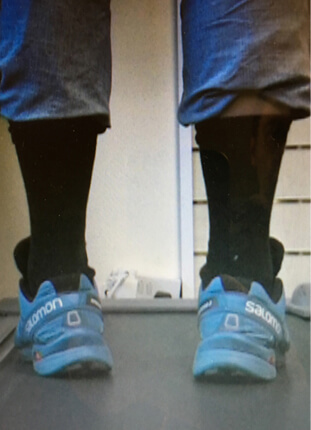 Whilst many stores offer a gait analysis service, very few really understand the way the foot works and most importantly how different shoes work. we were among the pioneers of video gait analysis in the UK. Since 2002 we have been using this method to find the best running shoes for you as an individual. We look at each person separately and uniquely. Having worked with some of the leading brands in the specialist running shoe trade we understand each and every element of running and running footwear and bring this together to offer our much-imitated service. We use permanent fixed cameras (not a Smartphone or iPad) and digital imaging in slow motion to identify exactly how the foot is moving through the gait cycle. We can then compare the effect of different shoes on your individual style. 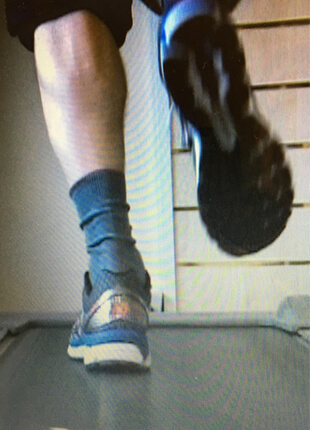 By filming you running (or walking if you wish) on our treadmills we can identify excessive movement and show the effect different shoes can have. Of course, it doesn’t end there, we understand the needs of the individual, their training and aims and consider these when helping you make a running shoe choice. If you have been experiencing injuries or just a few niggles with your current running shoe, our gait analysis service may be able to identify issues and help you on the right path to resolving them. High arches, low arches, plantar fasciitis, or other foot issues can also affect the rest of your body, so the right shoes make the perfect platform. No appointment is required, you can simply call in the store. Bring your existing shoes with you if you have some, but don’t worry, we have plenty available. 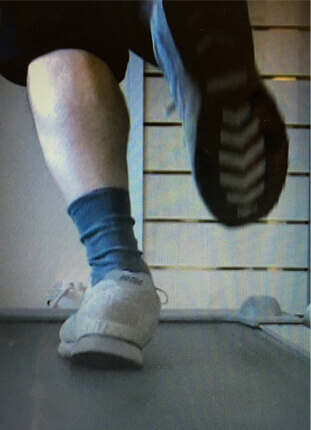 We can also offer video gait analysis as a stand-alone service, a little like a dental check-up, this is available at £25.00, but redeemable against a future purchase of footwear from ourselves. Injuries can add up and lead to a frustrating spell away from your chosen sport. Not just with running, but with running at the heart of everything from tennis and rugby to track and field and football, orthopaedic health is paramount to your ongoing success. Custom made orthotics are a bespoke device which ensures the individual foot is kept in its most efficient alignment. Custom made orthotics are popular with many athletes. Our 3D printed orthotics are the only orthotics in the world created based on a dynamic assessment of the foot. Gone are the days of simply standing in a foam box to have your foot ‘moulded’ only then to have pieces of foam cut and stuck onto your ‘foot-shaped’ pattern without any specific measurement. Our FOOTSCAN system uses a 1 metre long pressure sensitive mat with over 8000 sensors to ACURATELY measure the way the foot MOVES. After all, very few people get injured standing still – so why create orthotics this way! By 3D printing orthotics each one is precisely manufactured to your exact needs. A piece in PODIATRY TODAY looks at the issues faced with traditional orthotics and makes us question what exactly are you getting if you don’t have FULLY CUSTOMISED 3D printed orthotics. Our 3D custom made orthotics are totally bespoke, tailored to your specific foot care needs, based on our unique dynamic assessment. The orthotics/insoles ensure complete comfort and their materials and effect are individually created to manage your specific foot type. The orthotics act as a shock absorption by balancing your foot posture, this ensures that your body and feet are aligned into the correct position, therefore, improving the impact and pressure placed on the joints of your whole body. This, in turn, can reduce or even stop any heel pain, knee pain or hip pain. Bespoke orthotics can also be used to reduce/alleviate symptoms of foot conditions such as Plantar Fasciitis, Morton’s neuroma and arthritis. This can be performed due to the unique manufacturing process of 3D printing. This also means our orthotics are lightweight and comfortable as well as fitting in your existing footwear. Your foot posture in weight-bearing has an impact on all of your joints and muscles within and above your foot. Poor foot posture can lead to foot, ankle, shin, knee, hip and back pain. Custom made orthotics correct such foot posture by placing the foot into what is known as ‘neutral’, balancing the foot’s weight across the whole of the foot. Through correction of your foot, which in turn improves stability, posture and your foot’s individual movement. This will, in turn, improve performance whilst running, on the golf course, playing football or cycling. Scientifically backed algorithms help create a fully customised 3D printed model for the orthotic insole. Customer made orthotics cost from £200 plus consultation. Compare this cost against other non-specific orthotic insoles and the difference is clear. Call Paul on 01772 860 200 for more details. Whether you’re chasing after a qualifying time for the Olympic marathon or just want to play some tennis in your free time, you want to perform in the most optimal conditions. Free of injury on one hand, as efficiently as possible in your movements on the other. Good footwear which meets the needs of your feet, the surface you are playing on and the specifics of the sport you are playing, are indispensable. But good footwear isn’t always enough. In this case we can provide help. A footscan® analysis provides you with a scientifically backed, but easily understandable image of your feet, and it allows us to create an insole adapted to your feet, and more importantly, to your movement. This way you can prevent injury and increase the efficiency of your movement when you’re playing your sport. Accurately translating your movement into an adapted insole is unique in the world and is only made possible using our very advanced 3D-printing techniques. An abnormal foot motion also causes your sports shoes to wear out more quickly, so using a pair of Phits insoles will make your shoes last a little longer. On top of this a pair of Phits is very durable, and they last longer than other insoles made from different materials. Because of our state-of-the-art 3D-printing technology, they keep their shape really well, which guarantees their functionality.